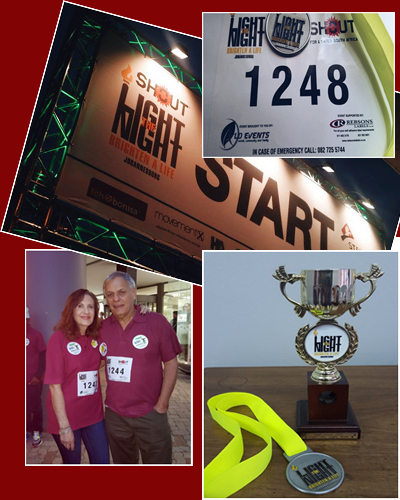 Rebsons Labels was a proud sponsor of the 2015 Light the Night inaugural walk held by Shout SA and Modsquad events. The event took place on the 27th of August at Rosebank Mall to shine the light against crime in South Africa and to raise funds to build a mobile library in Alexandra Township. With torches in hand, walkers began their 5km walk from Bath Avenue outside Rosebank and ended the night at the Rosebank Mall rooftop for a celebration. The celebration included various Shout ambassadors such as Danny K and Kabelo Mabalane, Natalie Du Toit, community leaders, activists and school children from various schools. The event ended on a high note for Rebsons Labels as our great team walked away with the Best Team award for the 2015 Light the Night Walk.